It’s nice to give your reader fans the personal touch. However, in this blog post, Rachel McCollin makes the case that a little automation is a good thing. And she takes us through a step-by-step process to set up automated emails delivering your reader magnets, so you never have to lift a finger again. 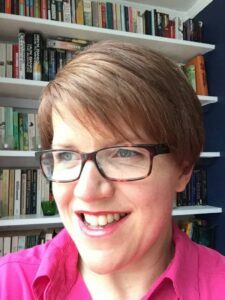 Rachel McCollin talks you through automating delivery of your reader magnets using Mailchimp and Bookfunnel. If you’re running an author mailing list (and you really should), you’ll probably know that it’s much easier to get people to sign up if you offer something in return. For fiction authors this could be a short story, a story collection, a novella, or even a full-length novel if you can spare one. For nonfiction authors, it could be a guide to a topic relevant to your books, a factsheet, short book or tutorial. Whatever it is, you’ll need to send it to people once they’ve signed up to your mailing list. And the quicker you can do this, the better. When someone has just signed up for your list, you’re at the forefront of their mind. They feel positively about you and your writing and will be eager to read that juicy reader magnet. If you’re sending out the reader magnet manually, it will mean a delay. Even if your mailing list provider informs you of a new signup immediately (and many don’t), you won’t be able to drop everything to send the reader magnet to them right away. Which means by the time they receive the file, the reader may have moved on and not be so enthusiastic about reading it. It also means extra work for you: who wants to spend their time sending out repetitive emails? Luckily, all of the major mailing list providers let you set up email automations: an email or series of emails which will be sent when a trigger is fired (i.e. a condition is met). And in this case, the trigger is that someone joined your mailing list. In this post, I’m going to show you how you can use MailChimp and BookFunnel to set up an automation sequence and deliver your reader magnet to readers in their preferred format. Once you’ve set it up, it’ll carry on working for you without you having to lift a finger. The principles here will apply to other mailing list providers, but I’ve chosen MailChimp because it seems to be the most popular among authors. And it’s the provider I used in this recent post about linking your WordPress website to your mailing list. A MailChimp account. If you’re with another provider, don’t fret: the principles here apply universally and you should be able to adapt this technique to your provider. A BookFunnel account.This will cost you $20 per year for their introductory plan. It will save you a lot of time, so I think it’s worth it. However, if you can’t afford BookFunnel, you could use Prolific Works instead (formerly Instafreebie). I like BookFunnel because of the attractive interface that’s easy for readers to use. The first thing is to create an automated email campaign and define its trigger. On the next screen, select Automated. You’ll see a list of potential triggers for your campaign. Select Welcome new subscribers. Enter the details and click the Begin button. You’ll now be presented with the setup screen for your autoresponder. MailChimp will already have created the first email for you. You can choose whether to just have one email in your sequence, or if you want to add more. Check the trigger that’s listed against your first email. In my case, MailChimp has defaulted to one day after people sign up. I don’t want that: I want it to be immediate (would anyone ever want any different?). Just click the Edit link and select immediately from the dropdown list then click the Update Trigger button. Let’s start with just the one for now. This will be the email that someone gets as soon as they sign up to your mailing list and that sends them your reader magnet. Now open up your BookFunnel account in another browser window (don’t close what you’ve been doing in MailChimp). Click the Add New Book button on the top right. Once you’re happy with your book description, scroll down to upload the files. Click on the upload area to select files from your computer, or drag and drop them into that area. BookFunnel will take mobi, epub and pdf files – it’s up to you which you use but I like to give my readers as much choice as possible. Don’t forget to add the book cover file as well as the interior files. Adding your book won’t give your readers anywhere to download it just yet: for that, you’ll have to create a download page. This step can be a bit confusing, because BookFunnel doesn’t prompt you to create a download page or take you to the relevant screen after saving your book. But it only takes a couple of clicks to get there. Scroll down to the Download Pages section. You want this section and not the Giveaway Pages section because you’ve already collected email addresses. Click the Add Page button. You’ll be taken to a new screen where you’re asked if you want to collect email addresses. Select No, just let them download the book. Then click the Create Page button. In the next screen, you can edit the settings for the page, including what’s displayed and what colors are used. Enter the name of the page (normally the title of the book) and click the + symbol to expand the Landing Page Settings pane. Now spend some time experimenting with this and checking the preview until you have it how you want it. Copy this so you can paste it into your email in a moment. So you now have your book uploaded to BookFunnel with a download page where people can get their copy. You’re almost done! Go back to your MailChimp account and open up that welcome email if you haven’t already got it open. You’ll need to choose a template for your email, define the subject line and add some content. If you want detailed guidance on creating emails in MailChimp, check out the MailChimp help pages. You can also make the image of your book into a link. Send yourself a test email to check it looks good and that you haven’t missed any typos. When you’re happy with things, click the Save and Continue button. You’ll then be taken back to the main screen for your autoresponder. If you want to, add more emails to your sequence (I tend to use three or four to give people a good introduction to my work). But if you don’t, that’s fine. Click the Next button to move to the next screen and activate your email automation. If you’re happy, click the Start Sending button on that screen. And that’s it! You can now go back to the important stuff (writing), happy in the knowledge that anyone signing up to your mailing list is getting your reader magnet without you lifting a finger. Create an email in MailChimp and set it to be an automated one. Edit the trigger so it sends immediately. Add your book to BookFunnel, uploading files for the interior and cover. 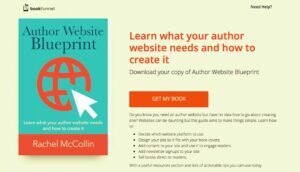 Create your download page in BookFunnel with the content and design that you want. Edit the content of your email, including the all-important link to the download page. Save the email automation and set it to start running. It takes some time to get this set up, especially if you want to create an engaging email which will do a great job of introducing you to your new subscribers. Don’t forget you can always add a second email to give them more information. For now, the focus is that reader magnet. But once you’ve done it, you won’t have to do anything to ensure that all your new signups get your reader magnet immediately, That has to be worth taking some time. I’m just about to go down this route, Rachel, so thank you for your timely post! A quick question, if I may… Should I create a different list (or audience, as Mailchimp now calls it) for subscribers who join through the reader magnet campaign so I can identify them as being different from an “organic” subscriber? Hi Hilary, thanks for the feedback! I’m pleased it came at the right time for you. Thank you so much. This was just what I needed. I had already signed up for Mailchimp and Book Funnel. I have a website with a link to join my mailing list ready to go live. I just had no idea what to do next! So now I can go ahead.